Gaul was the territory roughly made up of what is now modern France and was inhabited by peoples that the Romans collectively referred to as Gauls. Of course, like most peoples the Romans slapped labels on it was more complicated than that, as the Gauls consisted of dozens of tribes who were just as likely to be at odds with each other rather than the invading Germans or Romans. They shared a common language, religion, and some political structures which gave them a certain sense of camaraderie. The druids served as a unifying force, presiding over pan-Gallic meetings and passing on the teachings and stories of their tribes to the aristocracy. Despite being very learned, the druids did not write any of their knowledge down in order to maintain control which means that we have little firsthand knowledge of the Gauls. That is, until the Romans came. In 59 BCE, Julius Caesar began his conquest of the Gauls. 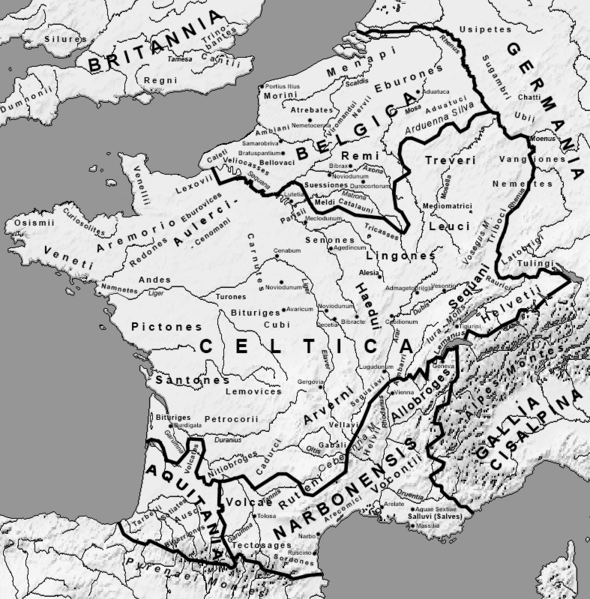 The Mediterranean coast was already a Roman province (Narbonensis) but Caesar was presented with an opportunity to expand when some Gallic tribes asked him to protect them from a migrating tribe of Germans. From that initial invitation, Caesar took the initiative and by 52 BCE, nearly all Gaul was under his control. Some tribes had capitulated, some had allied themselves with Caesar, and some had essentially been wiped from the map. But just when the Romans seemed to be the most secure, they came the closest to being cast out entirely. A reconstruction of Caesar’s Alesia fortifications. 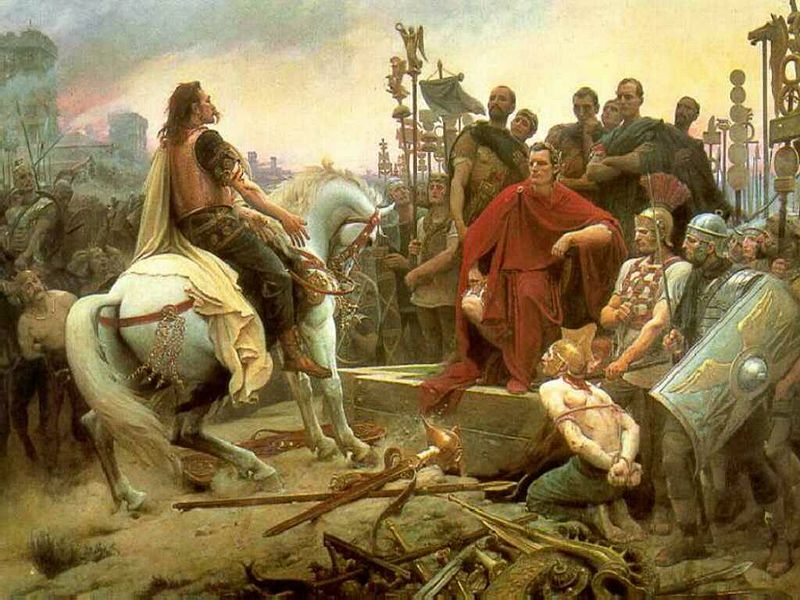 A Gallic noble who took the name Vercingetorix (which might mean “superior warrior king”) managed to unite nearly all the Gauls and dealt Caesar a surprising and costly defeat. But success would not last. Vercingetorix and his followers were besieged in the city of Alesia, surrounded by a wall built by the Romans to pen them in. 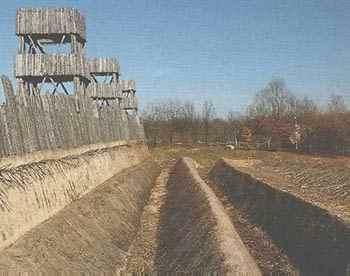 When word came that reinforcements were gathering to break Vercingetorix out, Caesar built a second wall to protect his own besieging troops. After failing to break through this double wall from either side, Vercingetorix surrendered and the last serious threat to Roman control of Gaul ended. Over a million Gauls, a fifth of the population, were said to have died during the conquest and another million were taken as slaves. Numbers that were no doubt exaggerated by the ancient sources but paint a picture of just how much Gaul was altered by the Roman conquest. For this broader first look, I will attempt to pull a large number of potential materials from the history of this region rather than focus on one thing. First, is conquest Gaul as a potential setting. A war torn land beset by invaders from two different civilizations and plagued by internal strife. A land of rivers and forests where the next adventure could lie beyond the bend in the water or behind any tree. Varied terrain from mountains to the southwest to plains in the north and with clear borders demarcated by oceans on three(ish) sides to provide reason for the PCs to remain within the area. Hill forts and fortified villages dot the landscape inhabited by farmers and warriors while the southern coast boasts cities of thousands which trade with the ancient empires surrounding the sea. And all this peopled by competing factions. A simplistic faction system in Gaul could be made along cultural lines of Romans, Gauls, and Germans. The mighty empire attempting to expand its holdings, the fractious locals competing amongst themselves as much as against the others, and the “barbarians” after little more than plunder. It would be easy to simply have these three be mutually opposed to one another but it is more interesting to borrow some of the alliances and necessities found in history. The Gauls invited the Romans in to protect them from Germans, who often became mercenaries for the Romans, who, in turn, were trying to subdue the Gauls, etc. And of course, these factions were lead by some fascinating people who would make great NPCs: Caesar, the man obsessed with self-promotion and conquered Gaul largely for his own glory but was also a canny general and beloved by his troops and the people back home; Vercingetorix, a noble whose ambition lead him to unite his splintered people under his leadership but who spent more time burning Gallic farms than fighting Romans. Either (or both) could be a great source of quests and adventures for your party. Perhaps Caesar needs you to assassinate the leader of Gallic tribe so that his pro-Roman brother can take over. Or Vercingetorix requires an ancient druidic artifact to prove that he is the prophesied king who would unite the Gauls and drive out all their enemies. Alesia could be a set piece moment where your loyalties are put to the final test and a choice must be made between the Gauls and the Romans (or choose the German option and simply try to get the most plunder for your work). This all just scratches the surface of what you can pull from Roman Gaul and I will be going back to it in the future to take a closer look at some elements but I hope this gives you all an idea of what history can bring to your games. Let me know in the comments some of your favourite people, places, and times throughout history and they might be featured on future instalments of History Hooks.